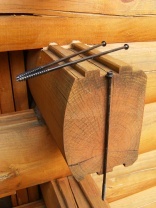 Typically there are half a dozen types of log fasteners used in log cabin building. If you’re buying a log home kit the manufacturer will tell you which ones they recommend to use and will supply them along with your logs. If you’re building on your own you need to decide which ones will suit you the best. The most effective and most commonly used log fasteners are log screws, like these Olylog 14" log screws. They're strong, easy to drive and easy to remove if necessary. Wooden dowels in this size are typically made of hardwood such as oak. They can be used to hold logs in place but not to pull them together. A hole is first carefully pre-drilled before setting the dowels. Drift pins made of rebar or galvanized pipe is set into pre-drilled holes to help resist sideways movement of the stacked logs. Again drift pins won’t help you pull the logs tight to each other. Lag bolts (AKA lag screws) are pointed bolts with screw threads and are set into pre-drilled holes through the logs. They are best used with washers to spread the load and prevent crushing of the wood fibers. Lag bolts are very strong and will pull the logs together. Through-bolts (AKA all-thread) that run through the entire log wall vertically. Threaded rod is often used to help with settling issues with springs that automatically maintain pressure on the logs to keep them tight. They are a cabin maintenance item that needs to be tightened by the homeowner as the logs dry and shrink. Spikes are nothing but big steel nails driven through the logs to secure them together. It can get very tiring driving home spikes all day with a sledge hammer. Not only are they a chore to install, but there is also a risk of damaging the logs as you drive them. Consider that each log needs to be secured with some type of fastener every 18" - 24" and you can see how tiresome using spikes can be. They may be traditional but new developments such as the log screw make more sense. The most commonly used log fastener are log screws. 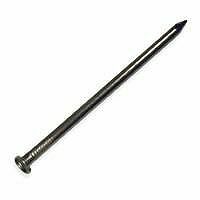 They are self-tapping long screws which can be set quickly and easily with an electric drill. They do not require a pre-drilled hole so they are very fast to use. Log screws have a shank diameter smaller than the threaded screw diameter so they pull the logs tight together as they are driven home. Although they look thin and fragile, log screws are heat-treated for superior strength. If you need to remove them to change the position of a log it's possible to simply reverse the drill and back them out. Log screws come in many different lengths and can be used to tie together beams and engineered lumber. 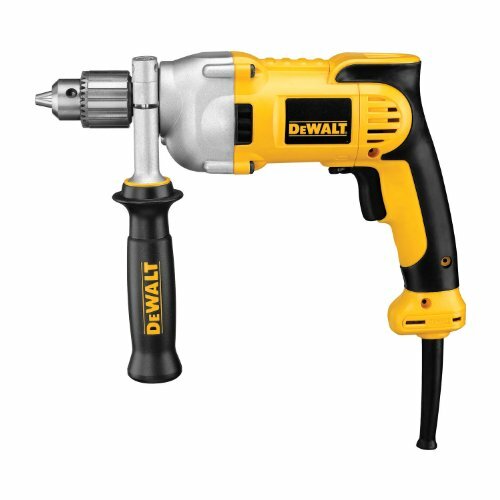 I typically use a heavy-duty drill/driver, like this 10-amp DeWalt, with a 5/16" hex head driver to drive the log screws. This is a robust set-up that can run all day without wearing you out by being too heavy. There are many different log cabin building systems that utilize their own proprietary fasteners for logs and if you are buying a log home kit it’s best to use their recommendations. 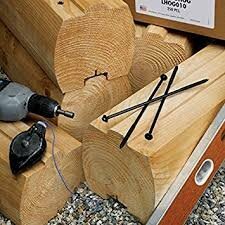 If you plan to build your own log cabin, the fastest and strongest fasteners are the log screws.